A biotech startup is likely to hold immense value which is entirely invisible to investors. This value comes in the form on employees, scientific and managerial know-how, intellectual property tied to the company, and many other features which lay hidden away from investors' sight, contributing nothing to the price tag of the company. Imagine shopping for a dress when you could only see 10% of it. It sounds risky and absurd, right? Yet many biotech investors are "shopping" for new ventures in this way every day. And the truth is, because of the riskiness of such investments, investors are understandably shying away from the biotech sector altogether . Investors would like to be sure that the management team have what it takes to bring the technology to fruition, that the intellectual property of the company is solid and valuable, and that the founders are experts in their field. Surely, due diligence can solve all that, but many investors won't even enter that stage when there is simply nothing to Google about the company. For founders who have passion and faith in their start-up, not maximizing the visibility of the brand's assets, particularly through 100% free and simple online means, is not doing their company justice. This is why collecting all the awesome company features under one brand umbrella, and making them visible to the world, will do huge favors to risk-wary investors, and will absolutely elevate the company above the rest during fundraising. And, when the company's product finally nears the market, the solid biotech brand built from day one will save a colossal amount of marketing effort, and significantly cut marketing costs. 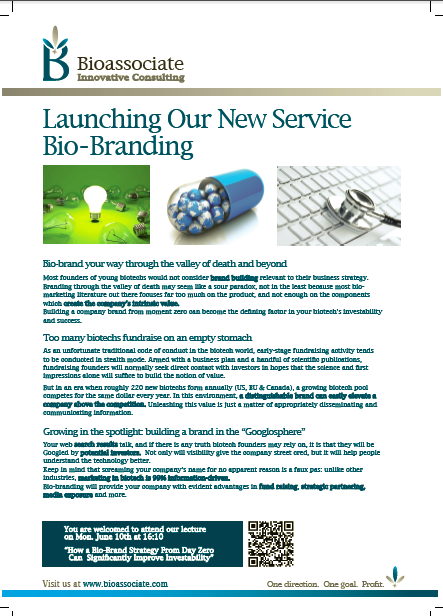 A month ago Bioassociate covered a marketing technique for your biotech start-ups: Bio-Branding. Below is a re-run of the article for those who have missed it. If there is any truth biotech founders may rely on, it is that they will be Googled by potential investors, says Bioassociate's Julia Skripka-Serry. 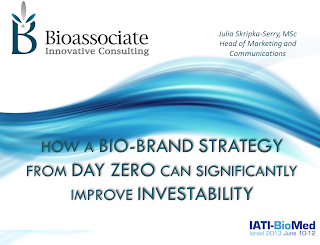 Building a bio-brand from day zero can become the defining factor in a biotech's investability and survival. Most founders of young biotechs wouldn't consider brand building relevant to their business strategy until at least half a decade post-inception. Branding through the valley of death may seem like a sour paradox, not in the least because most bio-marketing literature out there focuses far too much on the product, and not enough on the components which create the company's intrinsic value. If you happen to belong to the contingent of brand-skeptical founders, perhaps now is the time for a paradigm shift. Building a company brand from moment zero can become the defining factor in your biotech's investability and survival — unless, of course, you happen to be a serial entrepreneur with millions to spend on your new venture. As an unfortunate traditional code of conduct in the biotech world, seed- and early-stage fundraising activity tends to be conducted in stealth mode. Armed with a business plan and a handful of scientific publications, fundraising founders will normally seek direct contact angel / VC investors in hopes that the science and first impressions alone will suffice to build the notion of value. But in an era when roughly 220 new biotechs form annually (US, EU & Canada), a growing biotech pool competes for the same dollar every year. In this environment, a distinguishable brand can easily elevate a company above the competition. And chances are if a technology is ready for financing, the company already holds much more value than its founders may perceive. 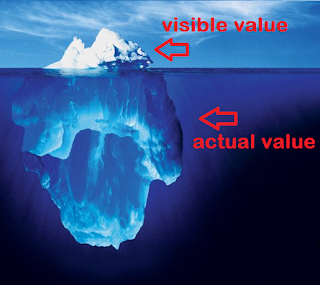 Unleashing this value is a matter of appropriately disseminating and communicating information. "If you happen to belong to the contingent of brand-skeptical founders, perhaps now is the time for a paradigm shift." Growing in the spotlight: building a brand in the "Googlosphere"
Your web search results talk, and if there is any truth biotech founders may rely on, it is that they will be Googled by potential investors. Has your company's founding scientist published breakthrough scientific material? Get him to summarize and publish it on a company blog (in layman's terms!). Has the therapeutic compound you are working on achieved outstanding results in pivotal trials? Let the world know about it on your company's LinkedIn page. Or, perhaps, your key technology is in-licensed and the management holds a wealth of experience in commercializing projects? Consider contributing a thought-leadership article on pharmaphorum. Not only will this visibility give the company street cred, but it will help people understand the technology. Scientific journals aren't titled Harry Potter and Nature Biotechnology for a reason – perhaps if scientific publications were thrilling (and cheap!) reads, investors wouldn't liken biotech investment to a trip to Vegas. A "Bio-brand" is essentially a collective of all the components which speak the company name. This includes the founders' and employees' reputation and expertise, intellectual property, publications, peer reviews and, most of all, the company's presence in the Googlosphere. "In truth, like in all aspects of marketing, the most successful campaign is the one that never ends." Blogger, LinkedIn, Facebook, Twitter, a wealth of online forums and leading websites which appreciate expert-based contribution are all valuable and completely free tools for establishing a solid company brand and for boosting the company's visibility in search results. Last time I checked, there seemed to be an infinity of such tools — thus, the question is, when can you stop building the brand? In truth, like in all aspects of marketing, the most successful campaign is the one that never ends. But this means that you can tailor brand building around your availability, and do a little at a time to contribute to continuous brand growth. An important side-note to keep in mind is that technology does not found itself, and investors tend to care immensely about a company's management. If every founder and employee published at least one thought-leadership article before fundraising, each would create a personal brand under the company umbrella, and the "sum of the jockeys" would contribute to a nifty initial value. It's no surprise that many leading companies request that their employees tweet and blog under the company brand: a personal brand is, rather bluntly, a personal price tag. And the sum of price tags is the worth of the shop. It is likely that company founders can already boast an abundance of value-creating information. They have certainly produced presentations, articles and personal notes in the past. Now it is just a matter of putting this information online and tying it to the company name. It is worth mentioning that screaming your company's name for no apparent reason is a faux pas: unlike other industries, marketing in biotech is 99% information-driven, where advertisements are value-carrying words, rather than shrewd slogans and subliminal imagery. When releasing information to the great wide web, put yourself in the shoes of the investor. It is astounding how many of those boxes an online search can help tick off. Keep these items in mind when producing online information, and watch your company's value grow in the investor's eyes. "...screaming your company's name for no apparent reason is a faux pas..."
Naturally, the valuable information you release will attract other experts who will share and cite it. In a world where much importance is put on assessing and validating our sources, brand value is directly proportional to the quality of the places you contribute to and the brand value of the people/entities which refer you. But ultimately, for a fund-seeking biotech, external value assessment and scientific evaluation is a powerful value-creating step. Larger-cap companies normally benefit from getting picked up and valuated by independent analysts, but companies of smaller scale are finding it increasingly useful to commission analyst coverage. Not only does a valuation report generate a wealth of information for online use, but it also expands the potential investor pool to those investors who would not have advanced time and money towards conducting due diligence on your company. Unlike all the other steps I mentioned, a valuation report isn't free, but it is certainly one of the only affordable and worthwhile options for brand building which I would recommend. We will be giving away our trade secrets in a free Elsevier Webinar, coming soon. Subscribe on our home page for an invitation. A solid biotech brand is an empire of expertise in the "Googlosphere" which can easily elevate one brand above another during fundraising rounds. 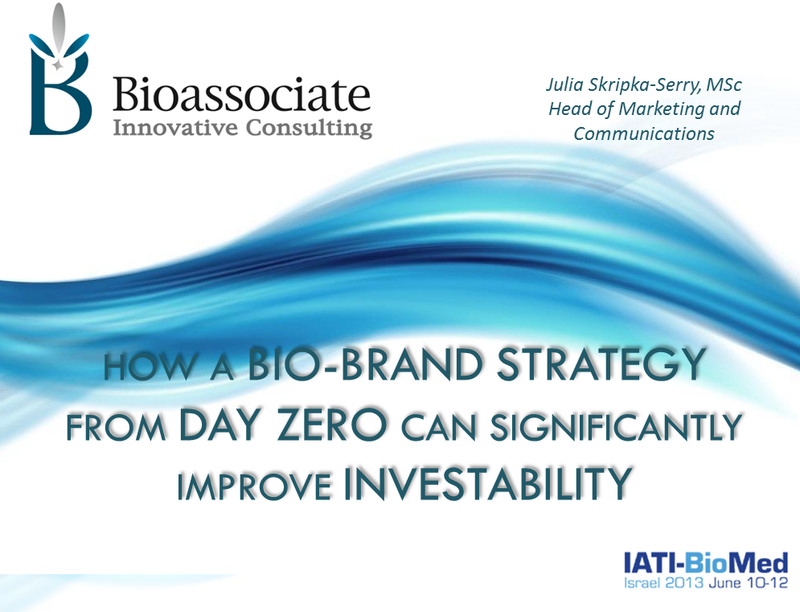 Bioassociate is now offering a service which lays solid foundations for companies' brand empires, and increases biotech startups' visibility through 100% expert-based, qualitative and informative content branding. Get in touch with us if you would like to learn more, and to arrange a free consultation.